Is Remote Work Working for You? It’s estimated 50% of the U.S. workforce holds a job that is compatible with at least partial telework and approximately 20-25% of the workforce teleworks at some frequency. I try to specify a USB receptacle in almost every kitchen project I work on. 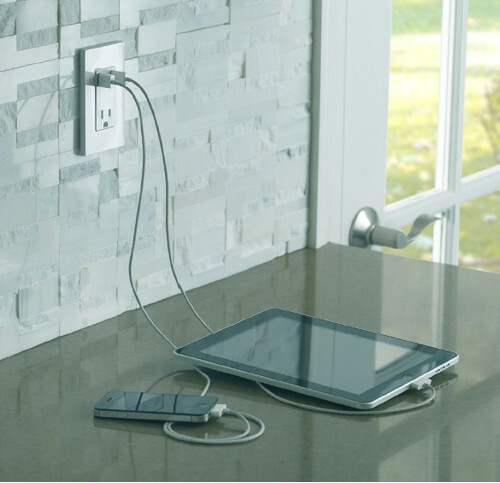 Designed to replace conventional duplex receptacles, it allows you to plug your mobile phones, tablets and other electronic devices into the wall without the need for a bulky AC adapter. The 15-amp receptacle has been around for a little while. But, many people do not know that a 20-amp receptacle is also available. This is good news for owners of devices – like iPads, that need more juice. The 20 Amp USB Charger/Tamper-Resistant Receptacle offers 2.1 amps of charging power inside a 20-amp, 125-volt tamper-resistant receptacle. The two USB ports on the Leviton receptacle are designed for use with different devices, depending on their power draw. The USB port on the left will output up to 0.7A, while the USB port on the right is capable of up to 2.1A. The right port also incorporates an auto-sensing chip, which will properly adjust the amps depending on the device connected. You’ll need to install a second receptacle if you plan to charge more than one higher current device at a time. 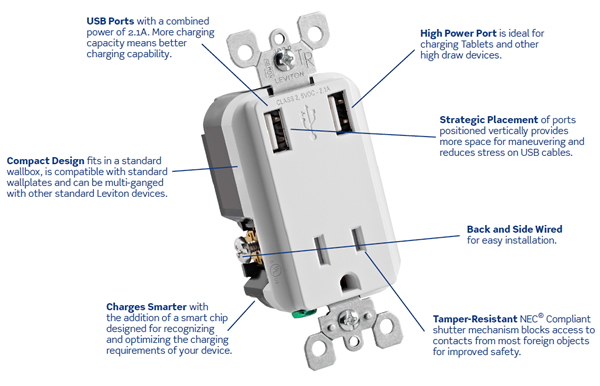 Each item in Leviton’s USB Charger/Tamper-Resistant Receptacle line is designed to fit in a standard wallbox, use a standard wallplate and can be multi-ganged with any standard Leviton wiring device. The Leviton in-wall USB charger comes in White (T5630-W) and Light Almond (T5630-T) and retails for around $21 and $26.